Females stand about 40 cm (16 in) high and weigh about 2.8 kg (6.2 lb) the males about 2.2 kg (4.9 lb). The plumage is streaky red-brown and spiky. 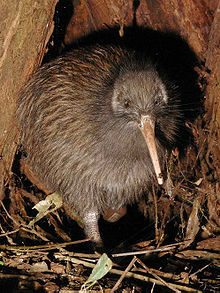 The North Island brown kiwi is the only species of kiwi found internationally in zoos. The North Island brown kiwi is Vulnerable, per the IUCN Red List, with the major threat coming from predators, such as dogs, cats, and stoat (Mustela erminea). 94% of chicks die before breeding in areas where mammalian pest control is not carried out. It has an occurrence range of 38,400 km2 (14,800 sq mi), with a population, estimated in 2000, of 35,000. ^ a b BirdLife International. 2017. Apteryx mantelli. The IUCN Red List of Threatened Species 2017: e.T45353580A119177586. https://dx.doi.org/10.2305/IUCN.UK.2017-3.RLTS.T45353580A119177586.en. Downloaded on 31 December 2018. ^ Ümüt Çınar (2015). "01 Pᴀʟᴇᴏɢɴᴀᴛʜᴀᴇ : Sᴛʀᴜᴛʜɪᴏɴɪfᴏʀᴍᴇs, Rʜᴇɪfᴏʀᴍᴇs, Cᴀsᴜᴀʀɪɪfᴏʀᴍᴇs, Aᴘᴛᴇʀʏɢɪfᴏʀᴍᴇs, Aᴇᴘʏᴏʀɴɪᴛʜɪfᴏʀᴍᴇs, Dɪɴᴏʀɴɪᴛʜɪfᴏʀᴍᴇs, Lɪᴛʜᴏʀɴɪᴛʜɪfᴏʀᴍᴇs, Tɪɴᴀᴍɪfᴏʀᴍᴇs & Rᴇfᴇʀᴇɴᴄᴇs". Retrieved 8 August 2016. Davies, S.J.J.F. (2003). "Kiwis". In Hutchins, Michael. Grzimek's Animal Life Encyclopedia. 8 Birds I Tinamous and Ratites to Hoatzins (2nd ed.). Farmington Hills, MI: Gale Group. pp. 89–92. ISBN 978-0-7876-5784-0. Wikimedia Commons has media related to Apteryx mantelli. Save the Kiwi (2008). "Population status of the North Island Brown Kiwi". Save the Kiwi. Archived from the original on 26 May 2009. Retrieved 9 July 2009.